Entrepreneurs are a unique breed of personalities and they like to do things our way & are known for our almost obsessive attraction to habits both good and bad. But, there’s a good reason for that. Our habits help us achieve our purpose, keep us motivated, reduces wasted time and improve our lives altogether. Arguably, the most important habit for businessmen is their morning routine. After all, if you start your day with the right foot, how motivated, productive & focused are you going to be for the rest of the day? To make sure that you begin your day right, here is a list of seven things that every businessmen should before 7 a.m. Successful businessmen like Richard Branson are known for waking up bright & early. – Explains Richard Branson, The Virgin Group founder. This may sound stupid, but there are a couple of valid reasons for not reaching for your phone first thing in the morning. First, placing it next to yourself throughout the night can interrupt your sleep because of the screen light and the notifications that go off throughout the night. Additionally, diving into your inbox or social media channels can be stressful & distract you from setting your personal priorities in the morning. Instead of setting your goals for the day, you’re responding to an angry email from a client. And that’s not the best way to start your day. Whether if it’s going for jogging, lifting weights, swimming, yoga or reciting oms, regular meditation or exercise reduces stress, makes you happier, boost your energy, helps you sleep better, boost your immune system and prevents you from developing future health concerns. Exercising and meditating each morning can help you focus on setting your daily goals and develop new ideas. 4. Eat a healthy breakfast. It’s a well-known fact that breakfast is the most important meal of the day since it’s going fuel your brain & body for the day. But, not all breakfasts are equal. Skip the donuts or leftover pizza & consume healthy carbohydrates like milk, low-fat protein like eggs, nuts, greens, and beans, fruits, veggies and Dairy alternatives like milk, almond, or rice. There are some days when you just don’t want to roll out of bed. The weather is crummy & you had a major setback – It’s not the end of the world, but it’s deadly enough to kill your inspiration for the next couple of days. That’s why successful businessmen practice lifting their spirits each morning. Whether it’s reading an inspiring book, motivational quotes, working on a passion project, or writing down your experiences or thoughts in a journal/blog, take a couple of minutes every morning to get in the right mindset before starting your day. – Says Tim Ferriss, entrepreneur, and author of The 4-Hour Workweek. 6. Set your goals & priorities. Every Monday morning set your goals for the entire week. Each day for the rest of the week write down the goals & priorities that need to happen that day. Think about how you’re going to achieve those goals while in the shower, jogging or whenever you have quiet time. The best way to cross items off your to-do list is by starting with the hardest task first. Get them done & over with now so that you can keep moving forward with ease. 7. Get down to business. Finally, it’s time to get down to business. You can now grab your phone, read, send emails, pop-in on your social media, check the news involving your industry & review metrics, such as the previous day’s sales and targets to be achieved. That data may alter your to-do-list, but because you got a head-start, you’ll be prepared & ready when it’s time to enter the office. 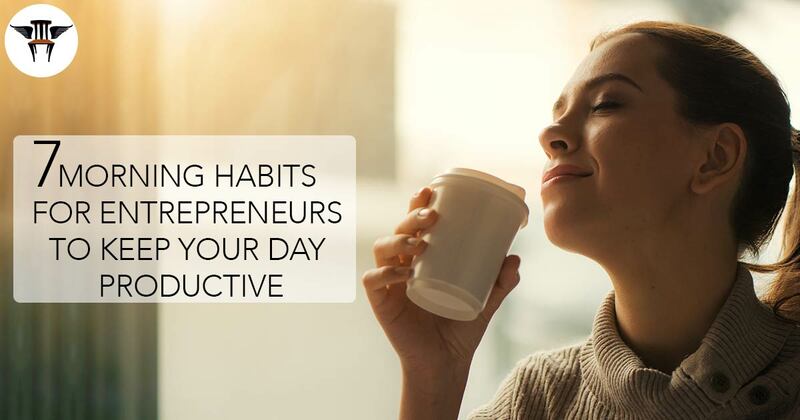 By creating, and sticking, to a morning routine you develop habits that will keep you productive, healthy, & prepared so that you can handle any situation. It may take some trial & error to find your ideal morning routine but it will make you more successful both personally and professionally. will be tweeting this to my followers! Great blog and great style and design. up is just nice and that i can think you’re knowledgeable on this subject.